In the last blog 1 we looked at Dr McDougall’s views on diet and kidney disease. This blog will look at what Dr Michael Greger 2 has to say on this important subject. 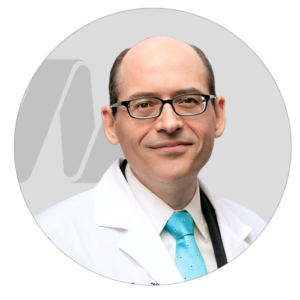 As we look at the advice Dr Greger gives, we will also dig a little deeper into some recent research studies that complement and expand his observations. Which animal food is most acid-forming? 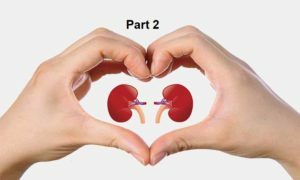 In a 2016 video 3 on this specific topic, Dr Greger explains that it’s perfectly rational to expect a plant-based diet can not only prevent but also treat kidney failure. 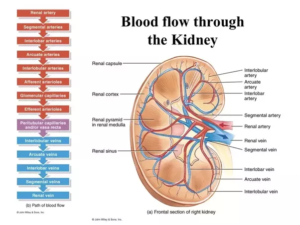 This is because kidneys are highly vascular organs, and we know that blood vessels throughout the body can be clogged up and impaired by eating the wrong diet. But what is the “wrong” diet? 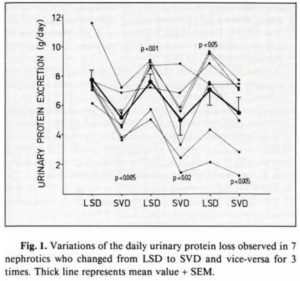 A 1998 study 8 showed how animal protein can kick the health out of normal kidney function, leading to hyperfiltration, where the kidneys have to work too hard and eventually can fail completely. But what about plant protein? 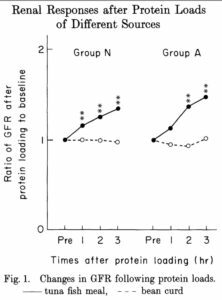 The following is a chart from the latter study, showing clearly that tuna protein and soy protein have profoundly different effects on the kidneys. The composition of amino acids within proteins, and the subtle but important differences between amino acids composition in animal vs plant proteins, are fascinating subjects, and nobody is better qualified to talk about them than Dr T Colin Campbell 10 . Inflammation is triggered when you eat animal products, and this inflammation causes the kidney overload. We’ve already looked at this in some detail in a previous blog 11 , and it’s a phenomenon already demonstrated in earlier studies, one of which 12 demonstrated that the animal protein caused the inflammation. They achieved this by looking at the inflammatory responses in subjects when they consumed animal products alone, and then when they consumed them with a powerful anti-inflammatory drug. In the former case, there was an inflammatory response; in the latter, none. So, simple choice: eat your animal products in combination with a powerful anti-inflammatory drug, or eat a plant-based diet. And, indeed, other studies 15 16 have corroborated their findings. A 2012 study 17 suggests that the key to slowing or stopping the progression of chronic kidney disease is more likely to be found in a grocery store, than in a pharmacy. 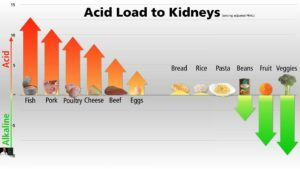 “Acid-inducing diets are believed to affect the kidney through tubular toxicity, damage to the tiny, delicate, urine-making tubes in the kidney via increased ammonia production. Ammonia is a base, so the kidney creates 31 it to buffer the acid from the food we eat. This is beneficial in the short term to get rid of the acid; however, in the long term, all that extra ammonia in our kidneys day in and day out seems to exert toxic effects. Our kidney function tends to decline 32 progressively after our 30s, and, by our 80s, our kidney capacity may be down to half. 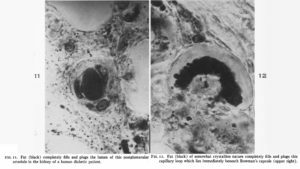 “Perhaps, the so-called age-related decline in renal function is a result of damage induced 33 by ammonia overproduction.” That’s just one theory, though. The acidic pH may increase the production of free radicals and damage the kidney that way, or add to scarring. In Part 3, we’ll look at the thoughts of Dr Dean Ornish’s medical/research team at his Preventive Medicine Research Institute (PMRI). Most of what Dr Greger says is in line with Dr McDougall’s recommendations. Once again, it appears that the take-home message is that a whole food plant-based diet (with no added salt, oil or sugar) is the ideal option for those who want to prevent or do their best to halt the progression of kidney disease.